The Japan Foundation, Manila, in cooperation with the Manila Chamber Orchestra (MCO) Foundation, Banco de Oro and UP Film Institute, offers a taste of the bi-annual Japanese Film Festival entitled Eiga Sai, at the Antonio Molina Hall, BDO South Tower, Makati and Cine Adarna, UP Film Institute, UP-Diliman. 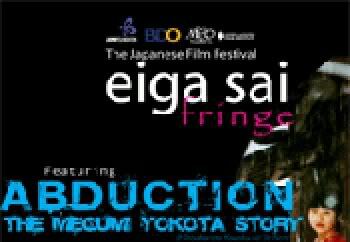 Dubbed Eiga Sai Fringe, the film festival mainly features specific theme such as conflict and environment in 16mm and DVD format. S creenings at the BDO South Tower Antonio Molina Hall will be on November 8-13. Nov. 8, 9 & 13 (5:00pm & 7:30pm), Nov. 10 (7:30pm), Nov. 11 (1:00pm, 3:30pm, & 5:30pm), Nov 12 (3:30pm & 5:30pm); at the UP Film Institute on November 14-15 and 17 (5:00pm & 7:00pm).